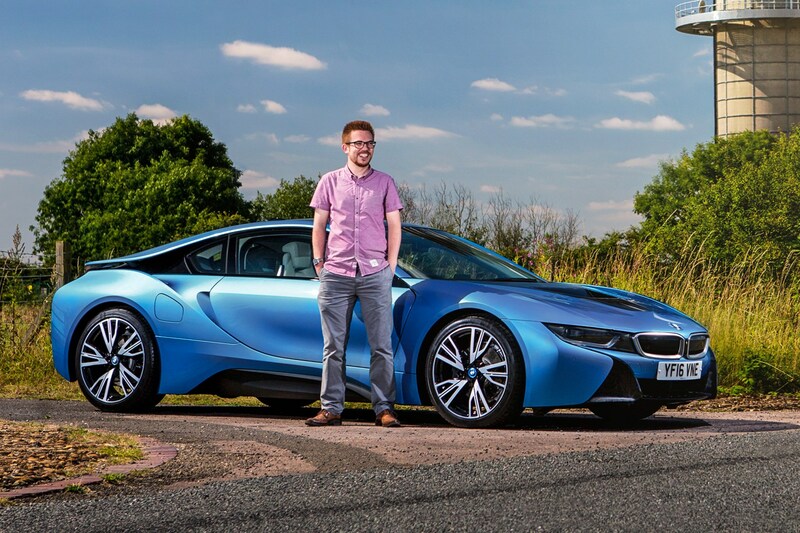 CAR ran an i8 long-termer just over a year ago now, and with the launch of the i8 Roadster looming, I jumped in an identically specced Coupe to get reacquainted with BMW’s original halo, hybrid supercar. But, even one year on, the i8 still divides opinion as much as the rear wing on my own Civic Type R long-termer. After a week with i8, I’m no closer working out where it fits into the supercar spectrum – and if it needs to fit anywhere at all. It’s got the looks, but I found steering and general agility a bit more vague than you’d expect. Don’t get me wrong, it doesn’t handle like a saloon, but its seating position and general feel is more more M5 than R8 - and I think my Type R could probably have it on a track. Despite its stiff, robust chassis the BMW feels more like a GT car; and that’s not really a bad thing at all. Yes, it isn’t as sharp as you’d expect, but it is significantly more comfortable – especially on poorly maintained motorways and B-roads. Four years since its release, the i8 is still an intriguing prospect – and with an refreshed i8 Roadster and Coupe in the horizon, the debate around the hybrid is only going to grow. Is it a supercar or GT car? Is it still relevant in 2018 – and most importantly, what will lopping off the roof mean? I’m looking forward to finding out. BMW’s designers must regularly frequent a five-star hotel that has its sole sun lounger in a fenced-off recess under a small, sharp-edged flight of stairs. That, at least, is the only reason I can imagine to explain why the absurd access to the i8 was deemed tolerable. 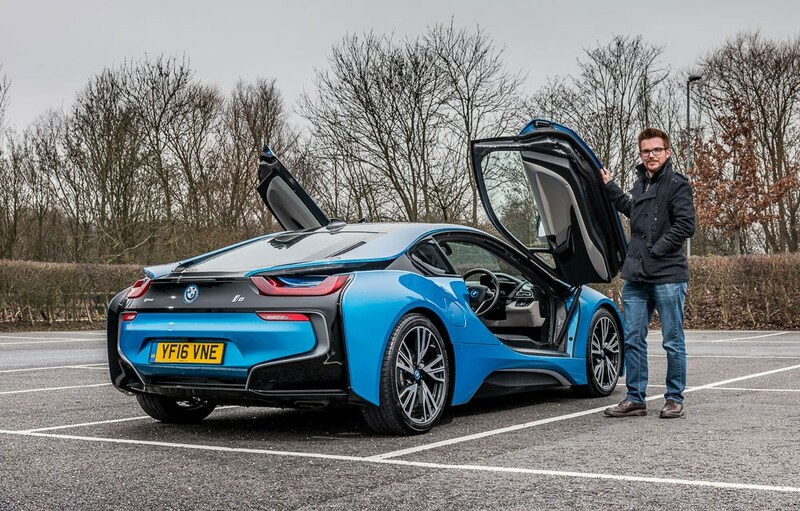 A knack for graceful entrances and exits does gradually develop over time, but the i8’s doors still occasionally elicited a sigh – particularly on those nights when you’d traipse off a jam-packed train, into the car park and find it hemmed in by other cars. Going to be using it regularly? Invest in some yoga classes to prepare yourself for when you need to post yourself through a tiny aperture to get into it (see inelegant demonstration below). That, however, proved to be about the only major issue with using the i8 – an advanced carbonfibre-tubbed hybrid sports car, lest we forget – on a daily basis. That, in itself, is no mean feat. And once you’d got into the i8, you were in for a far more comfortable experience. The seats are supportive and foible-free, road noise isn’t overly intrusive, and the climate control effortlessly and unobtrusively maintains the desired temperature. Other facets of the i8 have impressed in its time with us; its daily duty consisted primarily of a 110-mile motorway commute, during which its average consumption hovered around the 35mpg mark. The only thing it has needed is windscreen washer fluid and, as we speak, it’s still indicating 5000 miles until its next service – meaning minimal fuss for those entertaining higher annual mileages. The rear tyres are just about spent, however, so a £400 replacement pair is due soon. We struggled to find fault with the specified options. The Style 470 wheels (£1150) make the i8 look more supercar than eco-car, while the Carpo Carum Grey interior is brighter and more inviting than some. The optional Harman Kardon speaker upgrade proved to be a good choice too. The only gripe, it transpired, was that getting in and out resulted in lots of wear to the bolster – and a lot of dye transfer from people’s blue jeans. But in other ways the i8 divides opinion much more sharply. Out on the road, the public reaction to it appears equally divided between ‘you’re trying too hard, so I won’t even give it a glance’ and ‘please may I take a picture of it for my mum/wife/estranged cousin?’. And at first, those of us who drove CAR’s i8 seemed to be similarly divided – some were distinctly unimpressed, while others were in awe. Tellingly, however, the more the latter group drove it, the less frenetic about it they became. The fascination regarding its striking looks, curious electrical substation-like hum, in-gear flexibility and those doors gradually gave way to chatter about its numb steering, uninspiring interior and efficiency that’s unremarkable compared to the comically inflated claimed figures. It is, after all, a six-figure car and buyers would reasonably expect a more involving, evocative experience that went beyond the excitement of being an early adopter and drawing everyone’s attention. No complaints about its straight-line performance. The charismatic and boastful triple provides plenty of punch, and the Aisin AW-sourced six-speed automatic delivers swift, crisp shifts. The braking system’s intermittently dull responses can be frustrating, but a few sharp stops – getting a little heat into the hydraulic side of the system – appears to wake them up. Similarly, the electric motor’s ability to easily overwhelm the available front-end traction can lead to unseemly scrabbling, not befitting a £100k coupe – and the occasionally oddly judged interplay between front and rear powertrains can result in unnatural-feeling rotation. Other grievances? The A-pillars were also perfectly placed to obscure my view out at most junctions (more reach adjustment so we can sit further back, please), and the 42-litre tank results in overly frequent refuelling stops. The overriding question throughout, however, is why would you buy an i8? Well, for those dramatic looks and its hybrid tech, it seems. If your commute is brief, and you can make good use of the all-electric drive, it certainly has its appeal. It’s an intriguing car but one that – for me, at least – doesn’t deliver enough on the dynamic and efficiency front to justify its premium, particularly when you consider its weak residuals. A glance at the classified ads, for example, reveals several nearly new examples for around £32k less than list. Personally, I’d go for a less conspicuous Porsche 911, making a considerable saving in the process, and trade visual and technical appeal for driver appeal and superior ergonomics. 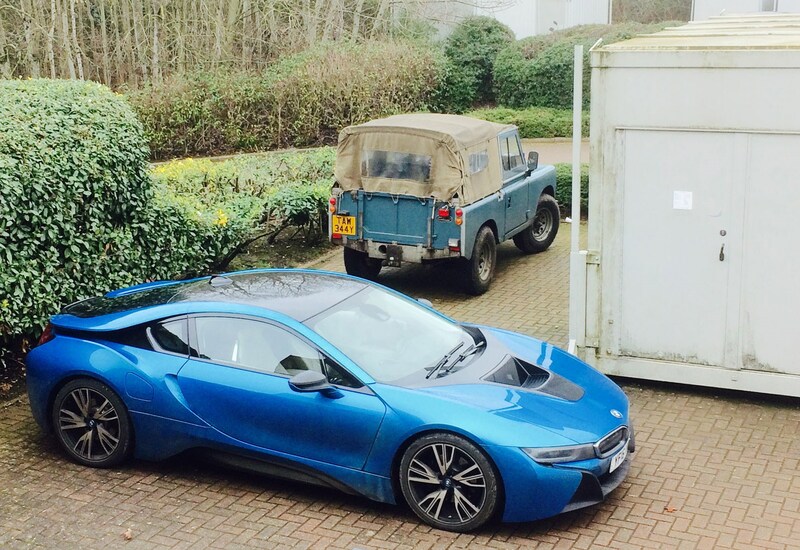 As a proof of concept, however, the i8 is remarkable – and it’s certainly a terrific starting point to work from. Here’s to the second generation. We’ve always known it’s an amazing car to drive, but after half a year we’re learning plenty more about living with the BMW i8. 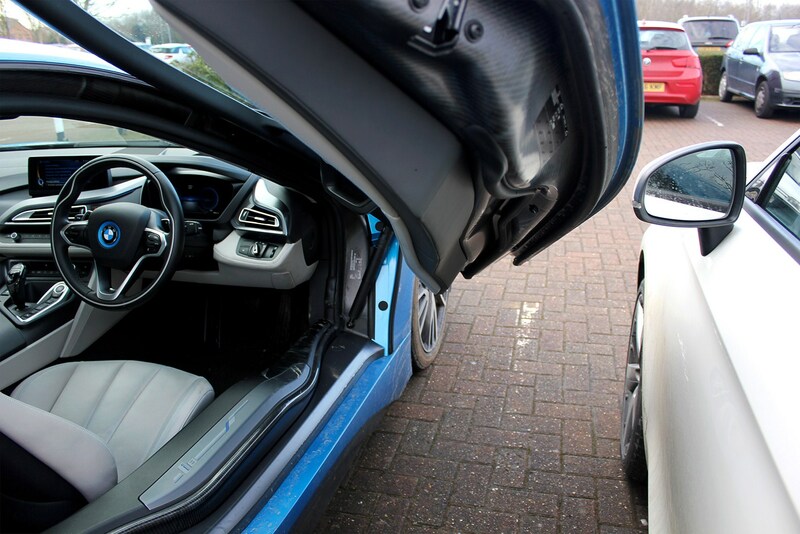 The i8’s dihedral doors can be opened fully in a tighter space than a conventional door. However, if an unwitting motorist parks fractionally too close, you’ve no chance of creating any meaningful aperture at all. Misjudge the gap from inside, similarly, and you may cleave the door mirror clean off the adjacent car. Want to preserve a decent level of battery charge so you can quietly idle around town using only electric power later? There’s a dedicated Hold State of Charge mode to enable just that. Battery out of charge? Fear not. Put the i8 in Sport mode, which runs the engine continually, and it’ll top up the battery as you drive. 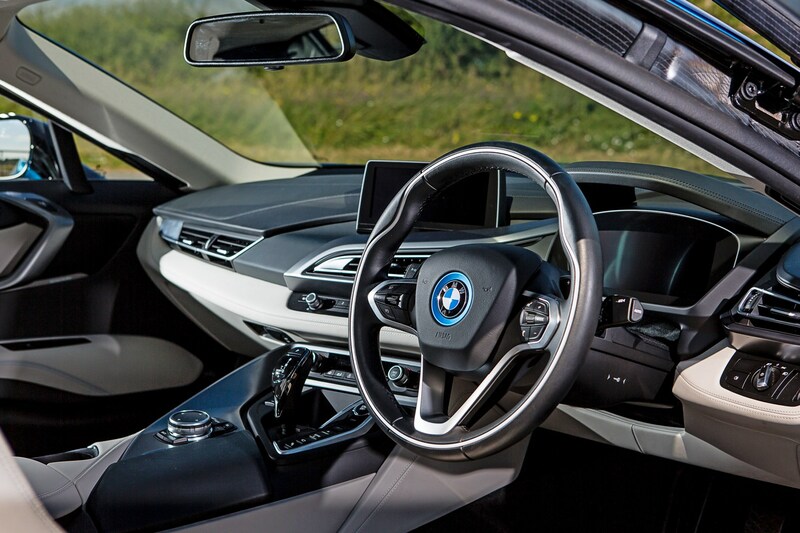 Fire up the BMW Remote app, or scroll to the relevant menu in the car, and you can set timers that will automatically bring the cabin up to temperature by the desired departure time. So, no more battling with ice scrapers or scorching seats. Best enabled when the parked car’s plugged in, to preserve the battery’s charge. 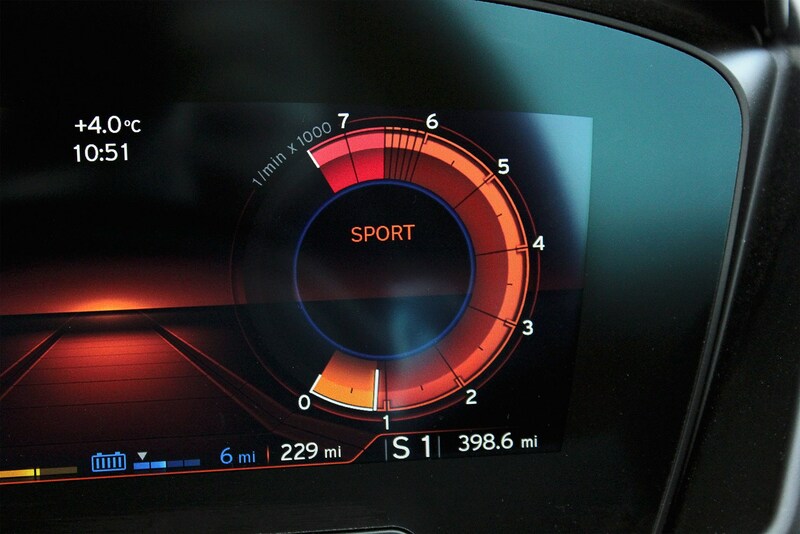 In Sport mode the i8 will not engage sixth gear automatically. So, if you’re just cruising, you’ll need to select it manually using the paddles – otherwise you’ll stay in fifth and burn through a lot more fuel. Also in Sport mode, charging the battery from empty (to its average 13-mile-remaining mark) takes around 40 minutes of driving. Month 5 running a BMW i8 plug-in hybrid: boot space! The i8’s boot is really small. BMW says it offers 154 litres of space. For comparison, the Smart ForTwo packs 260 litres. 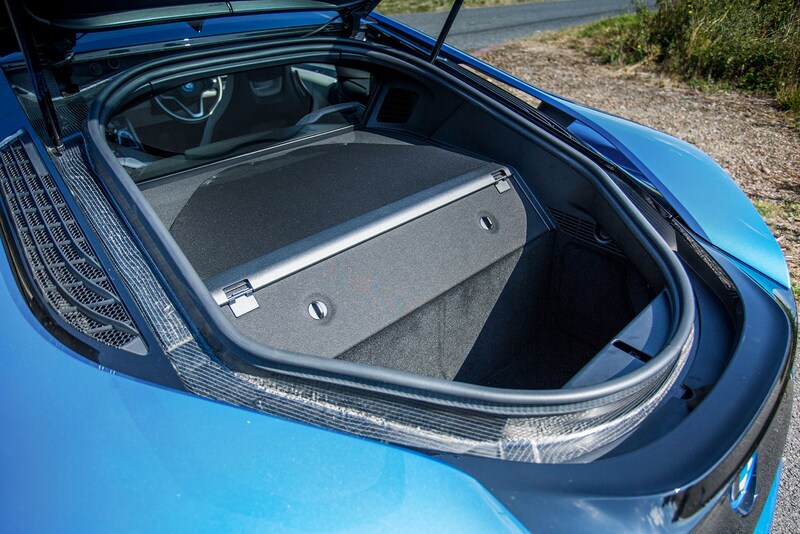 That doesn’t make the i8 entirely impractical: even with charging cables stowed, it’s still spacious enough for two decently sized soft bags or a moderately sized cabin case. You’ve also the back seats to call on for more stowage. Far behind many a rival for practicality, admittedly, but not frustratingly so. Life with a BMW i8 throws up all sorts of weird and wonderful juxtapositions. It's a sports car that's actually an eco warrior. A gullwinged, dramatically styled coupe that's also a four-seater well suited to school runs and trips to the shops. This duality at its heart is endlessly fascinating and one of the reasons it's wriggled its way into my affections. 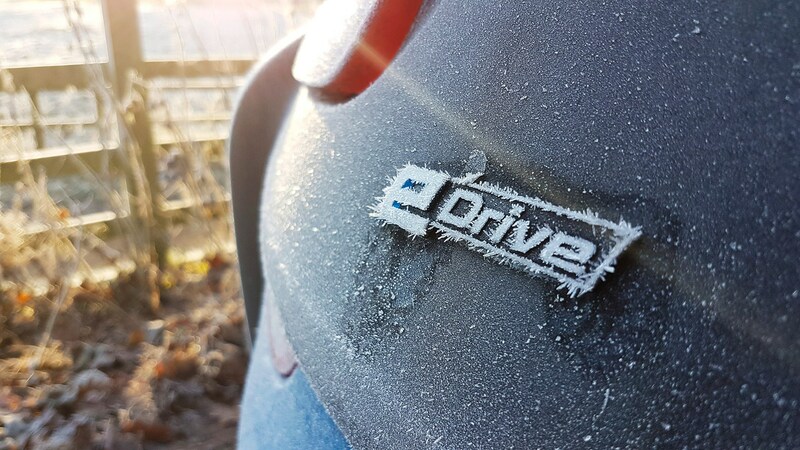 There's never a dull journey in an i8. One of the joys of working in an office like ours is the smorgasbord of interesting vehicles in the car park. Bauer Media also publishes most of Britain's motorcycling magazines, as well as a broad sweep of classic car titles and other specialist media such as Land Rover Owner. Which is why yet another contrast jolted me the other day. As I was parking the i8, I noticed this Series Land Rover (above) parked next door. Two wildly divergent machines: ancient and modern, yet both significant in their own way - with lightweight construction methods and a revolutionary mission statement. 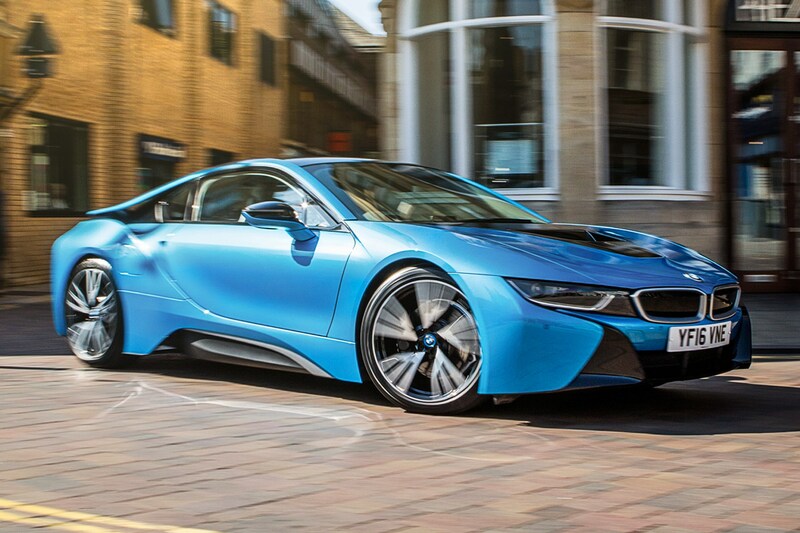 Will we remember the i8 so fondly in years to come? It's certainly a pioneering machine, whose import weighs above its actual sales clout. You don't see many about, but its significance shouldn't be underestimated... It's a marker for where BMW is heading. Month 4 with a BMW i8: Brake. Brake! Braaake! 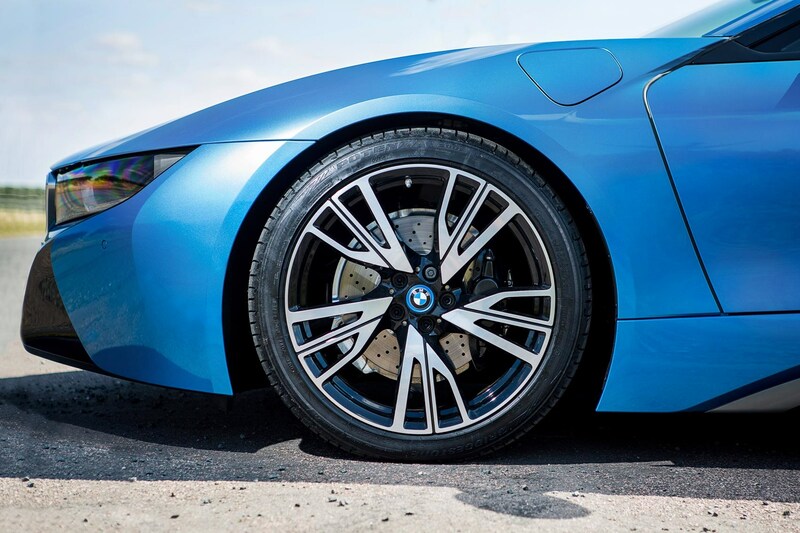 Stopping power, on paper at least, is not something the i8 should lack. At the front you’ll find substantial 340mm ventilated discs, clamped by fixed four-piston calipers, while at the back there are similarly large 330mm vented discs and single piston floating calipers. Then there’s the regenerative braking effort produced by the hybrid BMW’s electric motor. 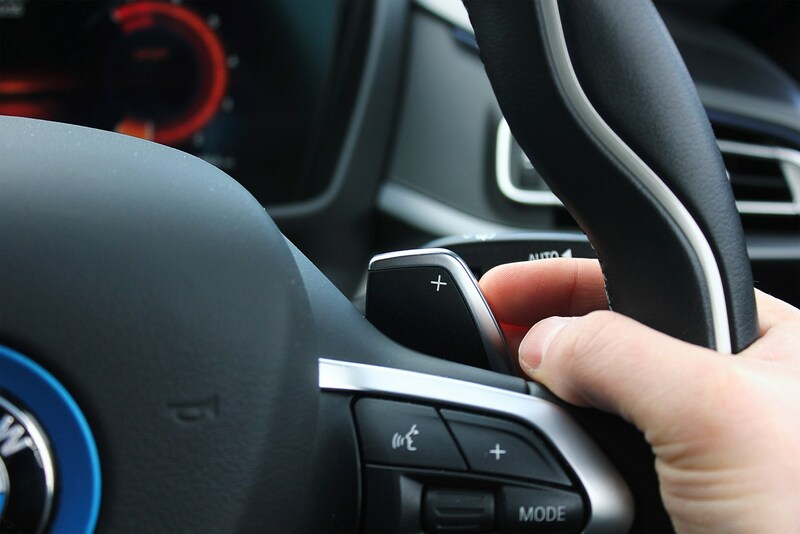 While not as significant as the maximum regenerative assistance offered in the i3, it’s more than enough to provide a passable and easily judged alternative to conventional engine braking – which, with a paddle pull or two, you can also call into action. 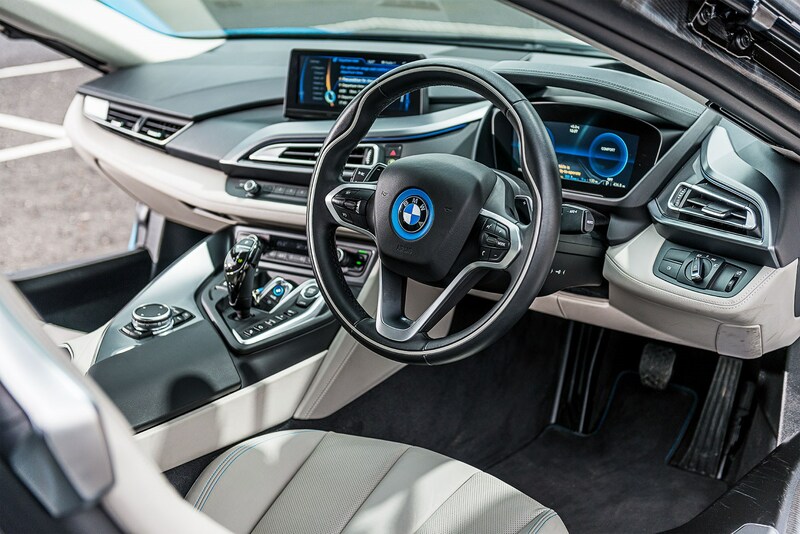 The i8’s headlights cast their blue-tinted light over signage at the entrance to an upcoming roundabout, and you scan for oncoming traffic, your left foot hovering over the brake pedal. Nothing, nothing – car! ‘No problem,’ you muse, rolling on to the brake pedal. It sinks slightly, then firms up. The i8 responds, but its nose barely dips. You squeeze harder – but you can’t feel any bite, just a gradual, unconvincing increase in drag. Panic time; throw out the anchors. 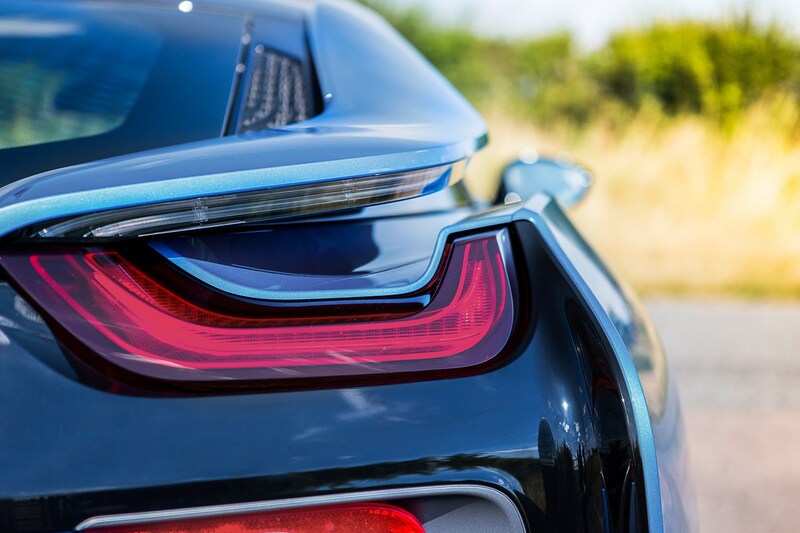 You lean into the pedal, clenching the wheel unconsciously, and the i8 winds down to a halt just shy of the line. And breathe. Some tweaks to the braking system appear to be in order, then. 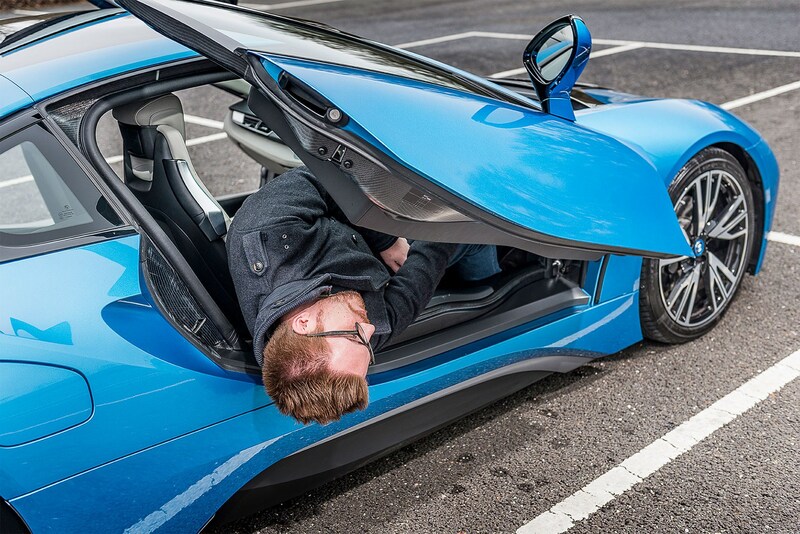 Sure, the i8 will stop – and responds to minor inputs well – but the effort required and lack of outright bite and feel can catch out the unwary. Found yourself behind the wheel of an i8? Leave a little extra stopping distance. Shock. Remotely assessing an engine based on a solitary figure is about as meaningful and as accurate as a plumber’s estimate. And yet, this ongoing tittle-tattle about isolated figures serves as an ever-present reminder that it’s all too easy to overlook the greater picture. While the i8 doesn’t draw any criticism for its specific output, with the 1.5-litre triple churning out 152bhp per litre (thanks, forced induction), several have balked at its 1560kg kerbweight. That, admittedly, might sound quite significant for a supposedly svelte, streamlined and advanced coupe. After all, BMW drew much attention to the i8’s carbonfibre-reinforced plastic passenger cell, its lightweight aluminium subframes and thermoplastic panels – yet it still weighs 35kg more than a PDK-equipped Porsche 911 Carrera. The i8’s battery pack weighs 98kg, however. The rest of its nose-mounted electric powertrain? Some 100kg. Consequently, stripped of its hybrid assets, the i8 would weigh about the same as a McLaren 540C – or 160kg less than the aforementioned 911. Upon learning this, most people about-face and take the view that the i8 is in fact a comparatively light car, considering its hardware. It frequently feels lighter than the figures suggest, too. The 184lb ft of torque served up instantly by the electric motor helps get the i8 off the line sharply, masking the car’s weight, before a rapidly spooled 236lb ft from the triple chimes in to assist further. Consequently, be it silently idling down a busy street, or passing slower traffic on country lanes, you’re rarely left wanting for accessible punch. Its bulk does make itself better known in tighter, sharper corners – with the forces involved often overwhelming the contact patches of the narrow drag- and friction-reducing tyres, leading to increasing degrees of understeer. No doubt, in conjunction with some chassis tuning, an intentional characteristic – it’s far safer, particularly when you consider that this car is seemingly aimed at early adopters rather than outright enthusiasts. Those looking to cover longer distances routinely may find the i8’s range an annoyance, however. You may hope, given its mooted high-economy hybrid nature, that it would go a long way on a full tank and fully charged battery. 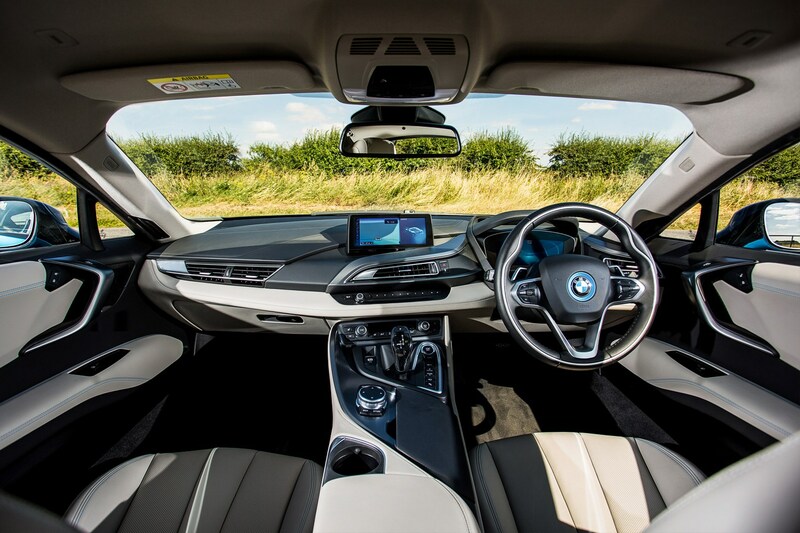 The reality is, particularly if you’re sat on the motorway or the battery’s low, that you can watch the BMW’s fuel level drop at a dissatisfying rate – the 1.5-litre triple is predictably kept fairly busy at higher speeds, for one thing, increasing consumption. More prominently, presumably due to packaging or a misguided weight-saving exercise, the i8 has a meagre 42-litre fuel tank. For comparison, that’s the same as a base-spec three-door Ford Fiesta – which weighs some 500kg less and packs 22% of the firepower. A 911? 64 litres, enabling a real-world range in excess of 400 miles. 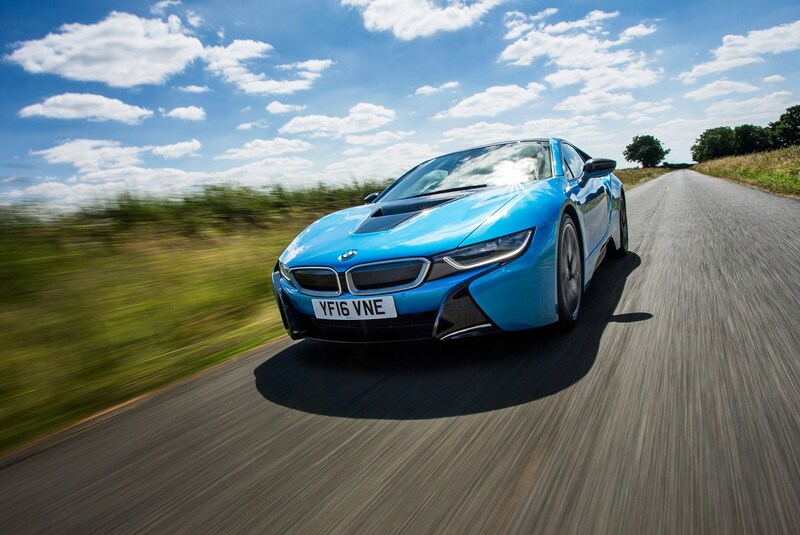 In normal conditions, the i8 will go from brim to a quarter – my mental ‘bingo fuel’ marker – in around 260 miles. Consequently, the length of my commute and position of filling stations throughout it necessitates that I refuel the i8 every other day. Improvements are no doubt possible, however, and it’s early days yet. 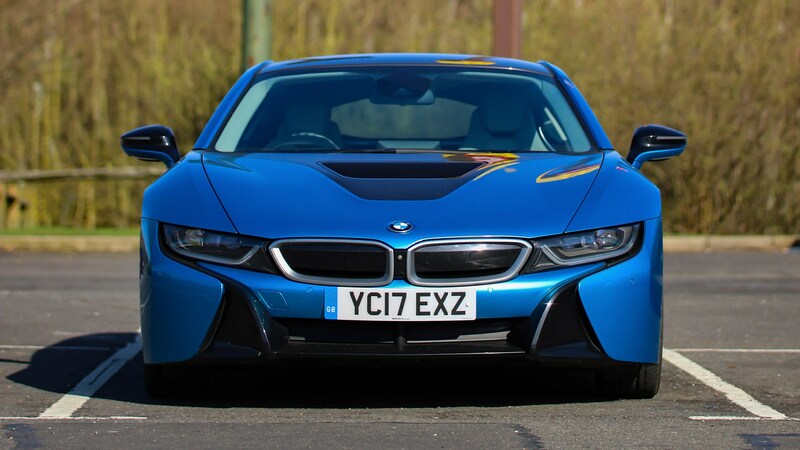 Admittedly, having to refuel your high-end sports coupe regularly is about as much of an issue as having to manually wind your Omega Speedmaster Professional – but the i8’s propensity to draw a crowd and its unerring ability to block access to multiple pumps (due to its width and the need to leave room to safely swing the doors up) makes refuelling a mildly more exasperating task than you may want it to be. The BMW i8 might look like it’ll require an FAA Commercial Astronaut rating to pilot, but it’s a remarkably simple car to operate. Get in, press start, engage drive, hammer down! Even those unfamiliar with modern cars, once they’ve stopped searching for an ignition barrel, will have no problems. It’s an accessible car. Case in point: pop the charging flap open and you’ll find a little illustration that explains what the various lights mean. No undue complication, zero fuss. ‘Engage,’ quips my passenger as the i8 creeps out of its space, industrial transformer-like hum drifting up from underneath. I oblige; near-silent EV power blends almost seamlessly with internal combustion, as the BMW’s mid-mounted three-cylinder joins the party. The i8 launches forwards, the speedometer in the head-up display performing a passable imitation of a slot machine’s reels. You have to work hard to suppress a grin. Even though it’s been on the market for two years now, the i8 can still bedazzle, its low-end torque, oft-silent running and curious, alien looks generating no end of intrigue. It remains a fast car, too; despite weighing in at 1560kg, the 3-series-sized coupe gets from 0-62mph in 4.4sec. That’s as quick as a PDK-equipped, freshly turbocharged Porsche 911. 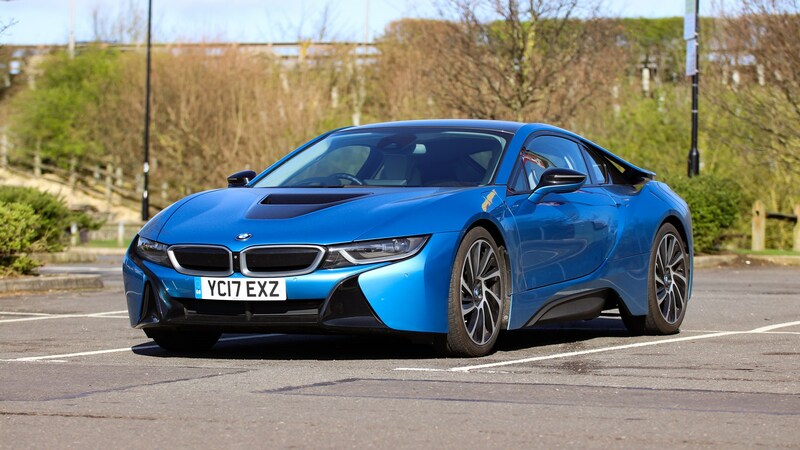 Yet, despite all the highlights, you could easily judge the i8 somewhat of a damp squib. It is a car that, unless you regularly frequent Knightsbridge or charging points, appears conspicuous by its absence, both on the road and in the wider domain. At the time of its launch it appeared to herald a new era of high-end sports cars – an advanced, composite-laden hybrid vision of the future that could comprehensively tick both ‘planet friendly’ and ‘driver satisfying’ boxes. People were wowed by the cinematic adverts, countless outlets commended the car and it racked up numerous awards. Yet, despite all this, its real-world impact – so far – appears to have been slight. The numbers appear to tell a different story. The initial allocation sold out not long after launch, and potential buyers later regularly encountered long waiting lists. And, as you read this now, the DVLA states that there are some 1200 registered in the UK. Sure, compared to the 3000 or so Teslas on our roads – similarly radical and different to own – not astounding, but then the i8 is a far costlier and less practical car, relegating it to the back bench for many. On the flipside, it can roam free from the catchment of charging points. Swings and internal combustion powered-roundabouts. 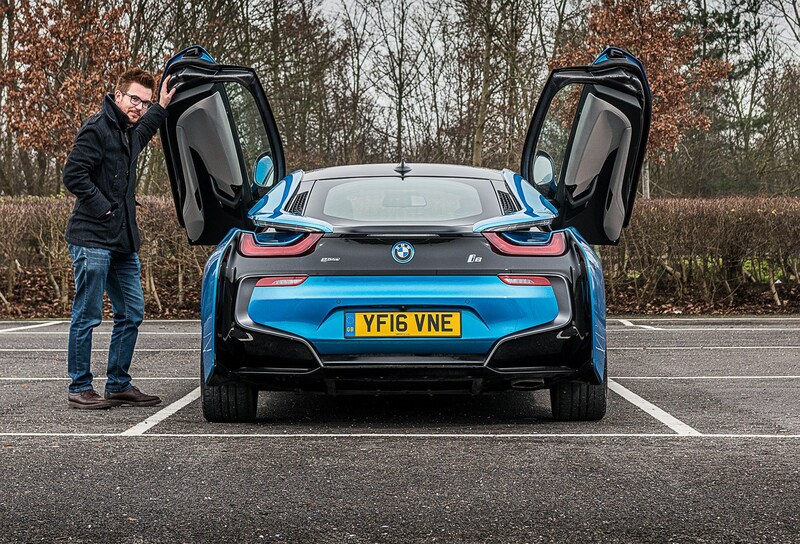 Supposition will only get us so far, which is why – in order to find what the reality of i8 ownership is and where its talents truly lie – we’ll be spending the next several months with this example. There’s immediately a hurdle to cross, however: sans options you’ll have to stump up £104,540 for it, likely raising a few eyebrows given that there’s no Stuttgart-branded shield or prancing horse on the nose. A little compensation comes, powertrain aside, in the form of a comprehensive kit list. Highlights include adaptive LED headlights, 8.8in media system, head-up display and 360-degree parking camera. Hardly radical, considering the rest of the car, but satisfactory. The options list isn’t extensive, so we’ve played it fairly conservative, picking a few choice upgrades in the form of attention-grabbing Protonic Blue paint, smarter 20in wheels, a stereo upgrade and a light grey interior pack. Externally, and on the road, the i8 initially impresses – yet, despite the upgraded trim, the interior doesn’t quite strike the right chord. Theatrical, impractical doors aside (more on that later), it looks and feels like any modern BMW inside, greatly reducing its supposed six-figure flagship appeal. 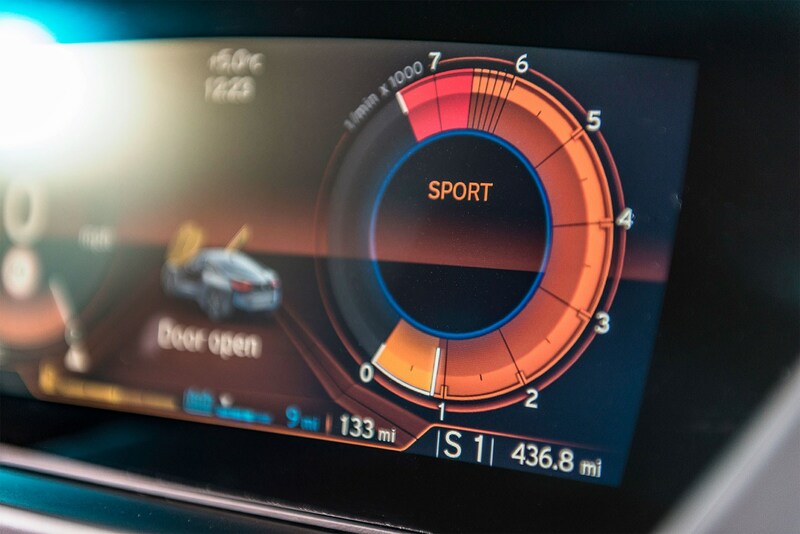 Yes, you have a digital instrument cluster – outmoded by the likes of Audi’s Virtual Cockpit – but there’s little else that tallies with the i8’s almost next-decade aura. That’s not to say it’s entirely devoid of charm; the blue ambient lighting adds some sci-fi verve, while a conventional head-up display cuts the number of eyes-down-eyes-up-truck-tailgate moments. The interior’s lack of drama is tempered a little, however, by the ever-pleasant novelty of sailing along at motorway speeds with nary a combustion event involved – at least locally. Then there’s the fact that, without a hint of effort, the BMW’s so far exceeding 35mpg. Looks like a supercar, performs like a top sports car, yet delivers large displacement saloon-like economy. 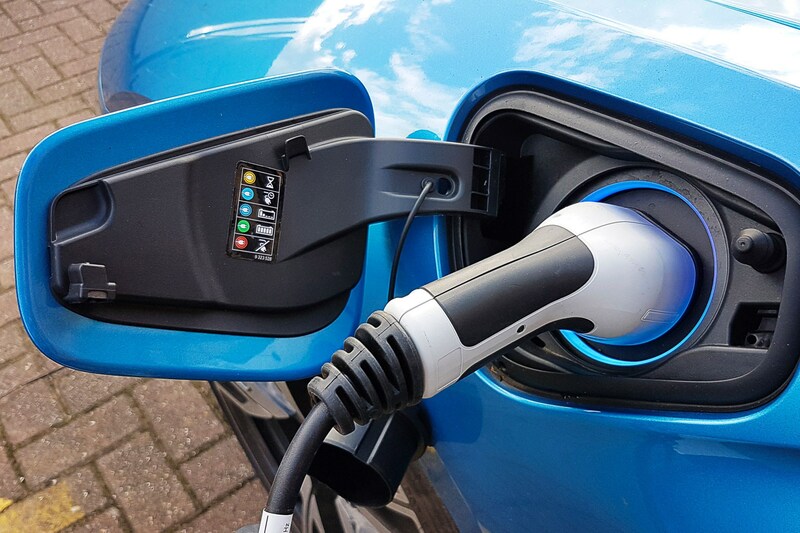 You don’t even have to stump up any VED, and the financial benefits keep on rolling in the form of low company car tax rates and exemption from congestion charging. Points that to many will be about as interesting as a post office queue, admittedly – but I doubt that the i8 will prove similarly uninteresting in the long run.